A slight departure was necessary this week, being this is the first semi-hollow thinline, J-type I've ever seen. Peekamoose is an NYC based outfit, specializing in hi-end custom work, restorations & repairs. They also produce 3 models based on the S, T & J body platforms. BTW, "Peekamoose" is the name of a mountain in the Catskills range. A recent post at Thumbrella tipped me off to Peekamoose guitars. 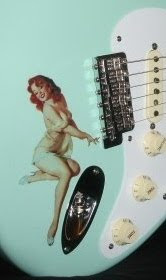 More of a hybrid than what its shape implies, the Model 3 features Duncan humbuckers (spec'd for Peekamoose), a functional bridge-- with tusq saddles, Sperzel hardware and notice the Strat jack plate. Our featured model has an ash body. 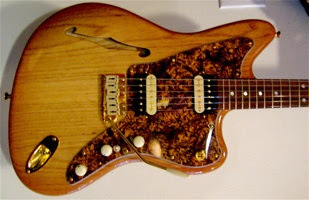 The f-hole thinline body is an option. All in all, this could be a fat sounding, SG eating barracuda.